Jennifer Wurtzel and Jian Xu are on the noon to midnight shift . They make physical propertiesmeasurements on the sediment as it arrives on board the boat. As the core comes up on to the deck from the bottom of the sea floor it experiences rapid changes of pressure and temperature. Holes are drilled into the plastic core liner (the case around the sediment) to allow the expansion of gases within the sediment. Initial measurements are taken quickly before the change in environment affects the core. 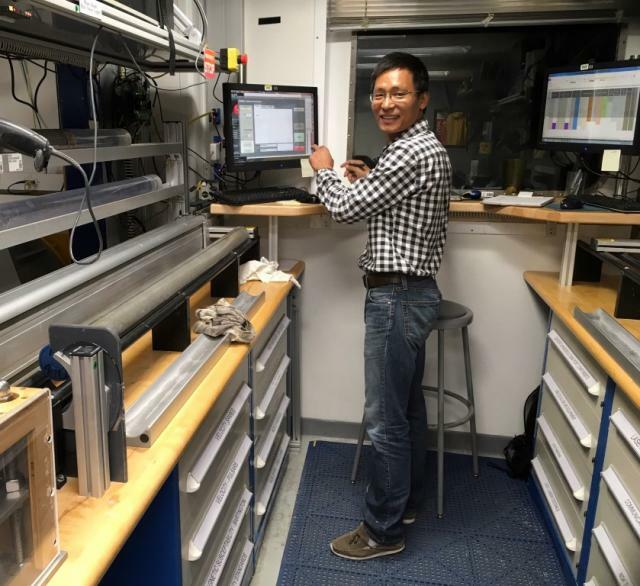 Jian is responsible for some of the first measurements taken on the core. He uses two instruments to measure the magnetic signature, and the density of the sediment. The natural gamma radiation is also measured – this gives us clues as to the composition of the sediment. These first measurements are used to help match cores from adjacent holes. Each individual hole will have sections of the core that are missing. This is unavoidable. The data Jian takes help other scientists to match signals between the cores. We hope that by using parts from the three cores we can make a continuous record of the sediment deposited. Jian has a particular interest in two of the sites we are collecting sediment from. He wants to determine changes to the subsurface water for the last 2 million years. He will do this by selecting a species of foraminifera and analyzing their shell or test. The magnesium to calcium ratio in the shell will help him determine the water temperature. Jian gained a PhD from Tongji University in Shanghai. He currently works at Northwest University in Xian. Jian has enjoyed living on the boat and has found the rocking motion makes it easy to sleep. He misses his 10 year old daughter. At home he usually spends time with her helping with her homework , playing badminton and going for walks. He is also looking forward to seeing friends and going out to eat Chinese food. Jian making measurements on the core. When she was at school she enjoyed science but her primary interest was with other planets. This has developed into a desire to understand the systems on our own planet. She is currently completing her PhD at Australia National University in Canberra. Her PhD focuses on analyzing stalagmites from caves. Stalagmites grow in layers in the same way that trees grow in rings. The oxygen isotopes in the layers can tell us a lot about the rainfall. Jennifer’s work has allowed her to reconstruct the past rainfall records in Sumatra the western part of the Warm Pool. Her interest in this expedition is to determine how rainfall may have changed in the eastern Warm Pool by using data collected on the expedition and comparing it with her own. From the work on this expedition she is hoping to see how the planet’s climate responds to changes in the way it orbits the sun. The mathematician Milankovitch predicted small regular changes to the way the Earth orbits the sun. There are three main changes to the orbit. The orbit changes from circular to more elliptical (eccentricity), the angle of the tilt of the Earth’s axis also changes (obliquity) and the position in the Earth’s orbit when the poles tilt towards the sun also changes (precession). All of these oscillations have their own frequency and effect on the climate patterns. Jen will be looking for signs of these regular oscillations to be reflected in the layers of sediment. She wants to try to understand how the changes in orbit (precession in particular) have affected climate systems. On board Jen analyses discrete samples from the core to determine moisture content and density. The wet and dry mass are weighed then a ‘pycnometer’ is used to measure the volume of the sediment. The pycnometer has chambers of precisely known volume. The sample is put into the chambers which are sealed. Gas is pumped into the chambers and the pressure and temperature of the gas used to calculate the volume of the material contained in the chamber. This data is used to validate the data measured by Jian. Jennifer lives in Canberra with her husband, an IT consultant. She is a skillful musician who plays the cello in quartets, quintets and in a symphony orchestra. 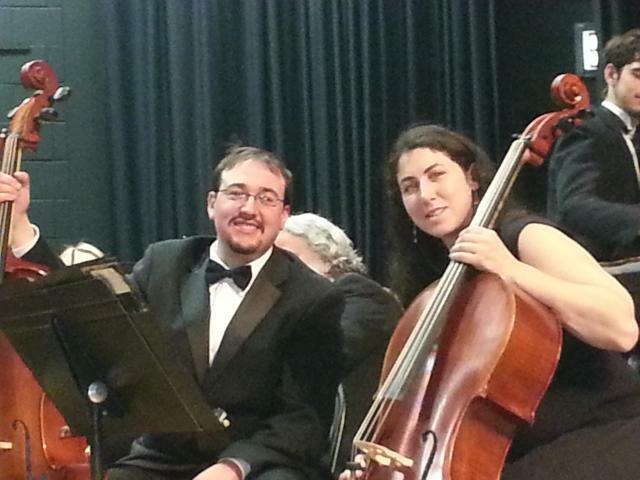 She enjoys playing for fun in the Canberra Chamber Music Players. Her husband also plays the cello. In Canberra they enjoy living near the nature reserves and going into the mountains. She recently won her college 3-minute thesis competition.